September 10th is World Suicide Awareness day. It is an opportunity to bring awareness and to open up dialogue about the struggle many people in our community face every day. It is also an opportunity to highlight that there is help and where to get support if you or someone you care about is struggling. 800 000 people die by suicide every year which translates to one death by suicide every 40 seconds. At CMHA WW suicide literacy is more important than ever! We are working diligently to develop and strengthen our services, provide value added education and build holistic awareness in our community of the resources available to our residents. We are working locally, provincially and internationally to build integrated connections and fully understand best practices in both suicide prevention and postvention care. We are fully committed to equip our staff with the skills, abilities and tools to recognize, understand and manage risk in the vulnerable residents and the community we support. Our residents include not only those who seek mental health and addictions services, but also those of us who work in this system and also may find ourselves in need of this very important and timely training. This past week our staff who work directly with those we support were given the opportunity to participate and engage in a comprehensive training with Dr. Craig Beach, a psychiatrist who practices forensic psychiatry and an expert on suicidal risk. This interactive training for 215 of our staff from a cross-section of CMHA WW services were engaged in an experiential training which included all risk factors related to suicide including the introduction of The Columbia Suicide Risk Assessment and Management SAFET-T tool, and risk assessment and management suicide prevention tool. This suite of Columbia tools has also been adopted by McMaster University and other key mental health organizations in Ontario. We heard from staff that the training was invaluable and will directly impact their day to day work. Each and every day, given the number of people who struggle with suicidal thoughts, attempt to end their lives by suicide and die by suicide, it is imperative that we develop, implement and evaluate a shared understanding and a common approach to the work we do every day. The lives of our residents, our peers and our community depends on it! The most important piece of our work is engaging people who are struggling with suicide and providing support when they need it. Here 24/7 is available to contact at any point. The team of service coordinators are available to support you in the moment and link you to services as needed. Please do not hesitate to reach out by calling Here 24/7 – 1-844-437-3247. We have offices in Cambridge, Waterloo, Kitchener, Guelph, Fergus, and Mount Forest. Click here for OFFICE LOCATIONS. 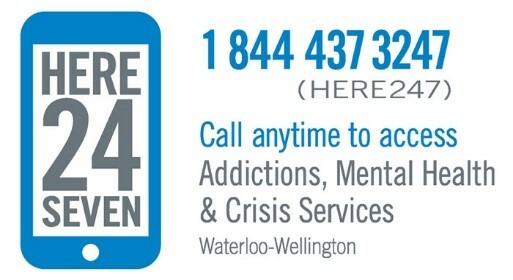 If you would like to connect with services immediately, or are not sure what you need, please call Here 24/7 at 1-844-437-3247 (HERE-247) or visit www.here247.ca.